Ranging in size from 1,591 sq ft to 4,240 sq ft, three of the units made available sit atop the Nicholson building, as well as one in the Hutchins Building. Priced from EUR2.25 million to EUR7.5 million, the penthouses are available to purchase through joint agents Savills and Sherry FitzGerald. The remaining two penthouses available within the Nicholson building on the seventh-floor measure 1,591 sq ft and 1,978 sq.ft. respectively, with two and three bedrooms and each come complete with full-length private terraces of 353 sq ft at the front of the building. The penthouses at Lansdowne Place provide a specification that is unmatched on the Irish residential market, with designs by renowned London-based interiors studio Goddard Littlefair. Delivering their first project in Ireland, unique features include spacious rooms that combine the beauty of outdoor living with indoor comforts, positioned to optimise light throughout. Every detail has been carefully considered, from the custom designed Irish craft integrated kitchens and matchbook marble worktops, to the impressive entrance halls and bathroom suites finished in limestone and marble. Residents also benefit from exclusive access to a world-class amenities and services at The Lansdowne Residents Club, a purpose-built leisure facility and 24-hour concierge service. The Residents’ Club is characterised by the sheer scale and service provided by the 24-hour concierge and management team, which also includes dedicated maintenance, security and guest relations teams. Spaced across two floors, totalling 6,500 sq ft, The Lansdowne Residents Club consists of a classically-designed lounge, library, meeting room, cinema room, private dining room with separate kitchen, as well as a terraced area. The lower ground floor comprises a full-service spa, comprising a gymnasium, fitness studio, sauna, steam room and individual treatment rooms. The spacious parking facility is located in the basement, which is accessible from street level. 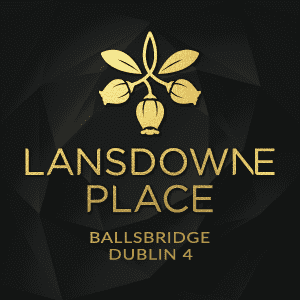 Designed by award-winning architecture practice O’Mahony Pike the wider development at Lansdowne Place comprises a collection of 215 one, two and three-bedroom apartments, spaced across seven contemporary buildings. One of the most important aspects of Lansdowne Place is the landscaping, which includes garden squares, feature planting, landscaped lawns, seating areas and a water feature, as well as a children’s play area. Set on the historic site of the former Trinity College Botanical Gardens, a number of original tree and plant specimens dating back over 150 years have been retained and preserved. Located in Ballsbridge, Dublin 4 an exceptional and unique area on the south side of Ireland’s capital city. Renowned for its mix of prestigious corporate office buildings and embassies, Ballsbridge is currently in the midst of a rejuvenation programme, which is being spearheaded by Chartered Land. The area around Lansdowne Place is set to become a thriving village quarter complete with high-end retail and fashion boutiques along with premium food and beverage offerings, as well as a first-class hotel development. Perfectly located, Ballsbridge is just 10 minutes from Dublin city centre and a 20-minute drive from Dublin International Airport, whilst the Irish Coast and its stretch of scenic natural beaches is just 20 minutes away. This article originally appeared in Perfect Homes, International Magazine, Issue 21.